It's a mad, mad monkey world again today! For today's craft challenge, I am again thinking about my daughter Emily's upcoming baby shower. (It's a good thing it's not a surprise, as she's a regular reader of this blog ... Hi, Em!) If you haven't guessed, the theme of the shower is Monkeys! I came up with these cute boxes for party favors. Now to decide what's going inside ... the beaded necklaces or bracelets the baby's Great Grandma is making for each guest?? To make this adorable box, I used one sheet of 8.5x11" deep pink cardstock and my Makes the Cut program. I downloaded the FREE Inkscape file for a "No Glue Party Box" found on the wonderful blog at My Cricut Scrapbooking. 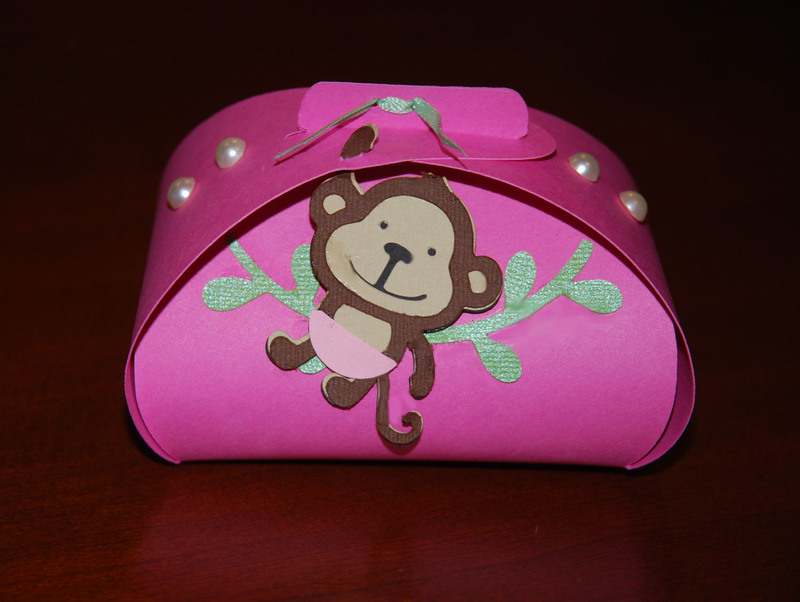 I used my Cricut Create A Critter to cut the adorable monkey and the branch behind her. I fussy-cut the pink diaper to make her a baby. The baby monkey hangs through a small hole punched on the edge of the box. Then I hole-punched a ribbon hole (double hole) in the top handle, folded up the box (or bent up without creasing, would be a better way to describe it), decorated with a bow, and embellished with Martha Stewart self-stick pearls. This week, I also got in some ADORABLE mylar baby monkey balloons and a matching personalized banner that reads: "Let's Go Bananas! Emily and Josh are having a baby!" Too cute! 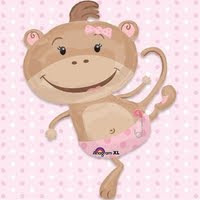 Meanwhile, thank you to the great website of BigDotofHappiness.com for your fab collection of baby girl monkey party goods!! !